Getting ready for the big day, nervous? Heck i am because there's still so many things i've yet to prepare myself and the house for (not forgetting Mori too). First things first, need to get essentials ready like a sleeping place for the baby, head support pillows, clothes, etc and the list seems never ending. And taking baby advice from Asians are one of the worst things one can ever do, so many dos and don'ts, plus the different variations of it just makes you head boggle even more *ugh*. So i am just gonna shop for what i think IS NECESSARY for the time being and other stuff when i need only when the time comes since i can easily get access to baby stuff online now. So no more having to drive out purposely just to get my supplies, let them come to momma instead (no pun intended lol). Some people do ask me why don't i get 2nd hand items since they are cheaper but let's put it this way 2nd hand stuff doesn't necessary means it's going to be cheap after calculating in the delivery/ COD costs and you don't even know how hygienic it is despite being claimed to be "cleaned & stored away". For the price might as well add in a couple more bucks (RM10-20) and you'll get a brand new item delivered to your doorstep instead. Makes more sense right? Today i'll be introducing Motherhood.com.my, for those of you yet to know about this website today's your lucky day because i'll be doing a walk-through on my blog and also sharing with you guys my shopping experience using this online shopping portal. It's safe, rest assured for those paranoid online shopping moms as all the merchants on them are direct brands or official distributors/ resellers, but just a heads up that Motherhood doesn't compile your orders and send it out one go, so you'll expect multiple packages sent to you over the week by different merchants. I too wasn't aware of that and thought that the website forgot some of my orders when the first parcel came lol, no wonder there was 3 invoices sent to me upon checking out as Motherhood doesn't consign any of their merchant's products (no warehouse or whatsoever) so all orders will directly be handled by merchants/ brands themselves. 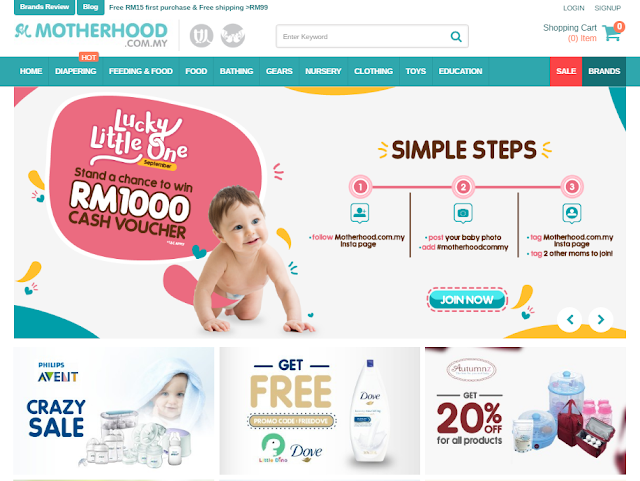 Motherhood's website provides a all in shopping solution platform for parents as they cover all ranges from maternity, newborn infants and toddlers, for those looking for baby gifts would also find this website useful! 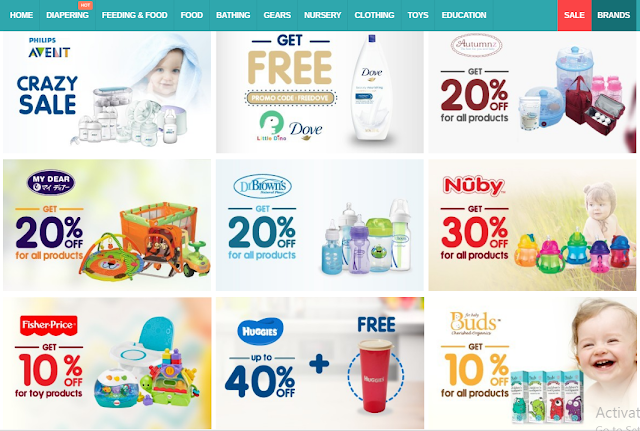 There's baby milk supplies, breast pumps, clothes, car seats, bedding, gears, diapers, strollers and basic education materials, all of them by renown brands like Philips, Mustela, Autumnz, My Dear, and many others, full list of brands can he found here. In my honest opinion, the deals and discounts offered on Motherhood helps me save alot, not only on money but also time as you all know being a mother 24 hours a day isn't enough if you gotta work, clean the house and care of your kid (+ other family members). Every new sign up, you'll get an immediate RM15 voucher for your first purchase, and you can use it on top of multiple voucher codes as well. Buyers can enjoy free shipping with purchases above RM99.Check out my haul video, what i got for only RM150! Less hassle of dragging your kid out to do your shopping especially if you don't have a babysitter or there's no one else to look after your kid while you run errands. You can even get groceries online now! Deals of the Day on Motherhood.com.my not to be missed! There's even a referral program you can earn credits from! Can immediately checkout when they price starts dropping lol. This sale is only 5 DAYS only, so your one chance to grab what you can from 26th - 30th of September, you can check out www.mycybersale.my for more details! so nice can shop online for baby stuffs nowadays, it's super convenient. in my days we had to shop physical stores and expos which are like super tiring for a pregnant mum. i see they have really great products on this site too.